← My 2014 Topps Bunt All Star Rosters! A few big releases over the last week or so, including some very nice cards that are going to be pretty hot and coveted cards to trade for over the next few months. Here is my write up. I really like the fire boosts a lot, and this one might be just as playable as Trout fire. 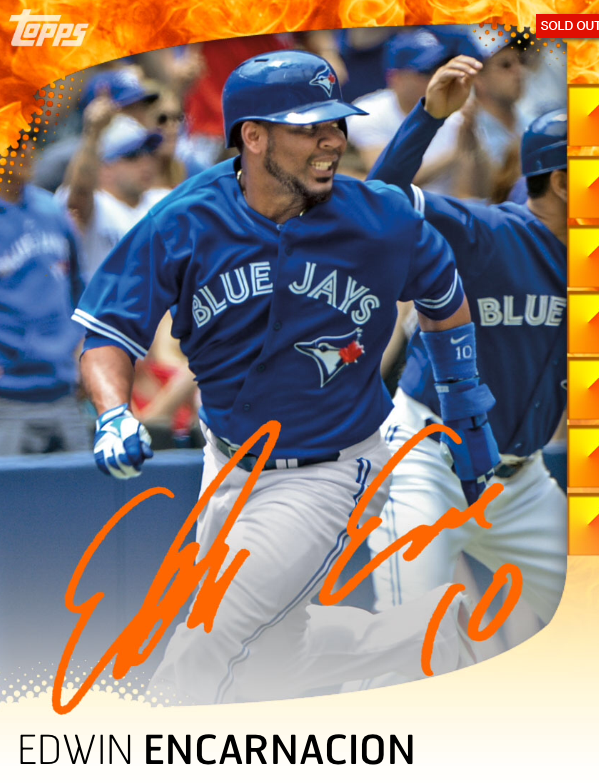 Encarnacion has been a beast this season, and the card here is one of the only hitter cards worth playing this season. His point levels rarely dip below 100 on this card, which means it is that much more valuable to have in your back pocket. Not to mention it is awesome looking on the card sheet if you have one. Posey hasnt exactly had the MVP caliber season he has had the last few years, but if there is going to be one representative of the Giants, I can understand why it would be him. Would like to see Lincecum or Hudson to be more playable, but Posey is the face of that franchise. Its coveted because its a sig and 400 copies, not because its playable. Great looking card I would be glad to have.